Just the collection your teens need to meet two of their top priorities; looking good, and having fun. 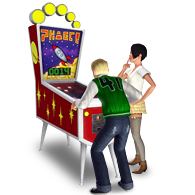 New stylish and trendy looks will keep your teens looking their best and Atomic Jack Planet Attack Pinball Machine guarentees hours of fun! Together they're a perfect match for teens everywhere!